Inventory We are a resale marketplace, not a box office or venue. Ticket prices may exceed face value. This site is not owned by TaxSlayer Center . The TaxSlayer Center, formerly I Wireless Center and the Mark of the Quad Cities, opened in May of 1993 with a Neil Diamond concert. 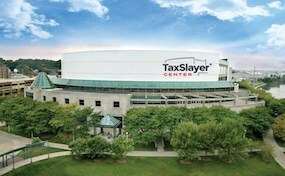 TaxSlayer Center Box Office is located on 1201 River Drive in Moline, Illinois. The 12000 seat venue has hosted NHL and NBA exhibition games, NCAA Basketball games, WWE shows, and various hockey and arena events. I Wireless purchased the naming rights in 2005 for the next 10 years before recently switching to TaxSlayer in 2017. TaxSlayer Center Tickets will include a bevy of great concerts in the upcoming months. TaxSlayer.CenterMoline.com offers is an independently owned and operated company that concentrates in all online sales in the secondary ticket market. We are not affiliated with any official box office or primary seller. To purchase tickets to all TaxSlayer Center events simply click the view tickets button or call at anytime.